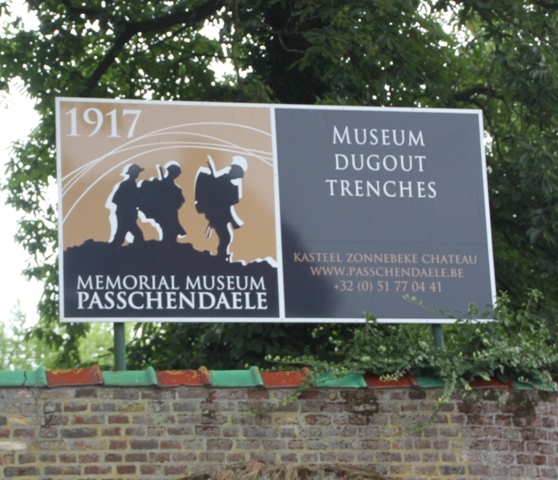 The Passchendaele 1917 Museum was not one I had researched or planned to visit during this trip. Not sure what there was to see and do, but having spotted leaflets just about everywhere we went in Flanders I thought we might as well go since we were in the area. The little village of Zonnebeke is only five miles north-east of Ypres, a tiny place and we parked on the main (only) street and headed in through the museum gates. A gorgeous setting, there was a lovely park and gardens beside a lake. Later we discovered the museum is housed in what was once a castle. After it was bombed in World War 1 they built a chalet style mansion house instead – not your typical museum for sure. A playground and plenty of space to run around and let off steam before the serious stuff indoors worked well for Son. 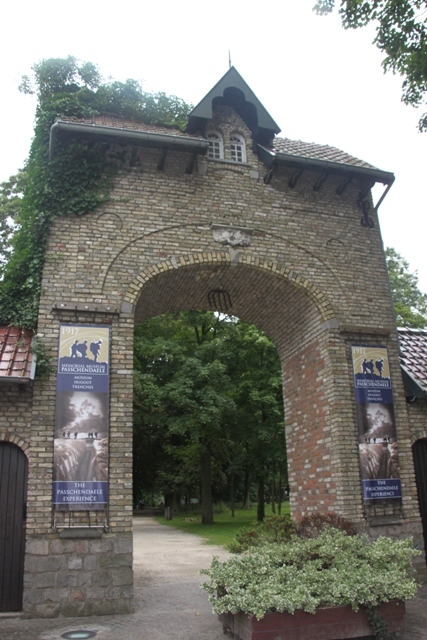 The museum focuses mainly on the Battle of Passchendaele in 1917. Entrance was remarkably cheap, I thought it would be a small place and we’d spend an hour or so inside. Wrong on all counts – it was huge, extensive and we spent the rest of the afternoon exploring. 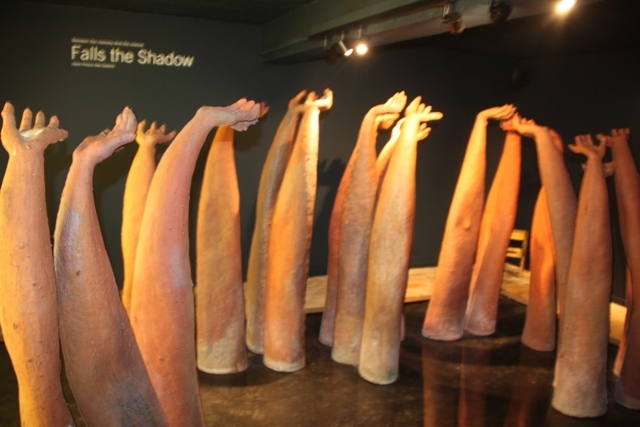 Split into several different sections, the first part was just like a traditional museum. 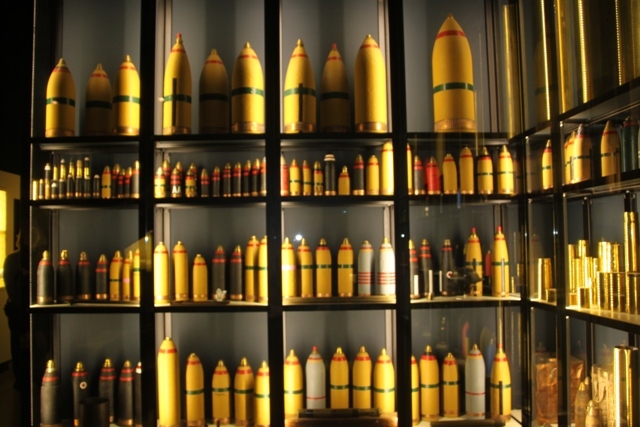 Full of artefacts and exhibits in glass cases explaining the background to the battle and other aspects of the war. Husband and I found it all compelling, Son not so much. We were rushed through more than a bit by him, he found it a little dry and had no concentration or desire to read all the heavy stuff. There were a few hands on items which he enjoyed, but eager to move through quickly, we had no choice but to follow. 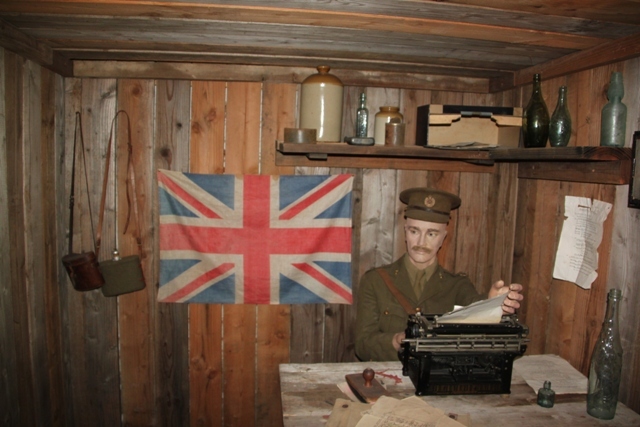 A fascinating area lay just ahead – an impressive reconstruction of the dugouts. We went down a whole series of steps and ended up twenty feet under the ground. An extensive warren of corridors to explore, lots of rooms, nooks and crannies to look in and touching was not off limits. This definitely appealed to Son – well all of us actually. 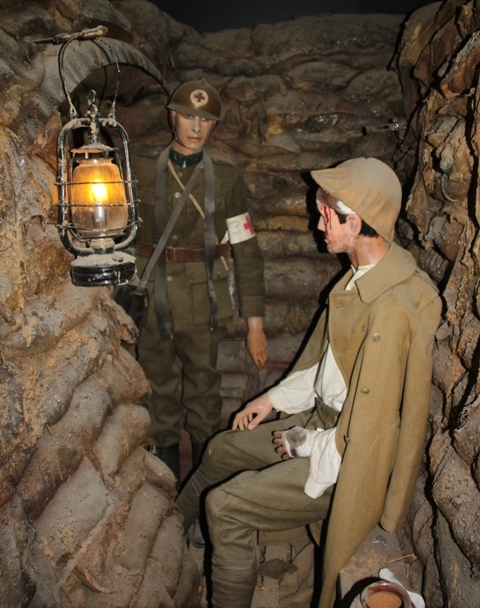 We checked out the first aid room, Son tried out a very uncomfortable soldier’s bed and was more than a bit interested in those communal toilets. Dark and gloomy with sounds and smells of the time made for a very effective and memorable experience. We emerged above ground and found a more modern area with exhibits on the Commonwealth battalions and soldiers. They had weapons displays and an absorbing film in a little cinema all about the Battle of Passchendaele. The highlight was yet to come. 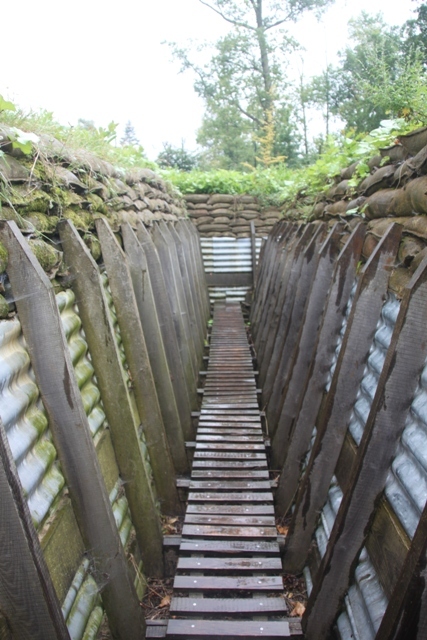 Having been in the real trenches that morning, we were all fascinated to be able to explore an extensive replica trench here. They have a reworking of the British and German trenches using the same materials and same methods of construction as those in 1914-1918. Intriguing to see how the trenches would have looked and plenty of information to read and take in throughout this little tour. The last and final part of the museum was more reflective. Assorted artefacts and artwork on display and a real focus on the futility of war. Absorbing and a fitting end to what turned out to be the most incredible museum. If you are ever in this area, don’t miss this place. What an incredible find! This is the reason why my mum is addicted to picking up leaflets! 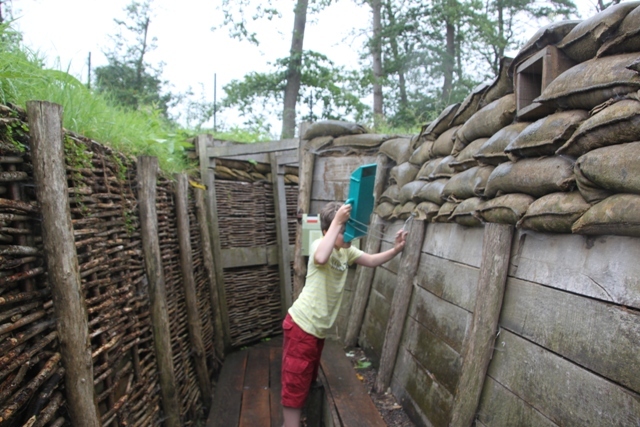 I was intrigued to see the woven wooden walls in one of the reconstructed trenches too, just behind Son in the photo of him with the periscope. It’s such an ancient building technique, it was weird to see it in a 20th century trench! Did the exhibition mention this at all? I am a leaflet addict too, most times they get discarded, this was a lucky find. No mention of that technique though so also interesting to know!! Looks like somewhere to put on a ‘must visit’ list. Absolutely Andrew, there are so many little museums and exhibitions in this area, one round every corner but this one was a gem – so interesting and so well laid out, I would go back. Looks really interesting! A good find. 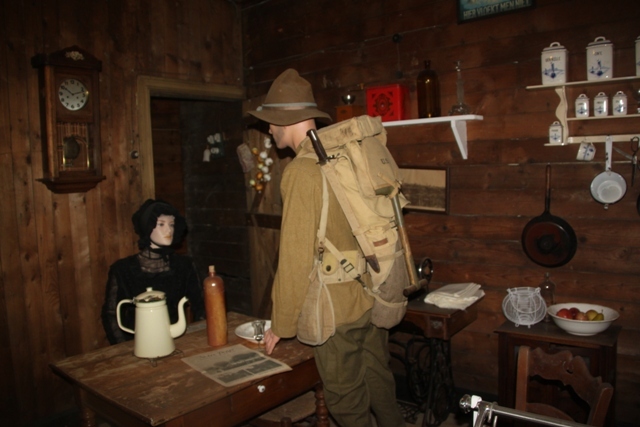 We still haven’t been to the two big WW1 exhibitions on here in Wellington. Will def post on them once we have been. It was outstanding, the different displays and combination of hands-on and other experiences made it really great for adults and children alike. Looking forward to reading about those exhibitions in Wellington! We were so glad we did stumble upon this museum, such a great surprise. The combination of traditional style museum with these replica things was just spot on – such a great day out and such a great way of learning about how awful those times were. Don’t you just love that about travel, those surprise finds that turn out to be treasures? It’s often the unplanned stuff that ends up being the highlight of our trips. This museum looks fantastic, thoroughly absorbing. I think my kids would be like your son and race through the artifacts to get to the interactive element. I’m sure kids gain a lot of understanding from placing themselves in that similar situation and that it sparks their imaginations and empathy. This was just one of those gems Laura, in my meticulous pre-trip planning it didn’t even feature, we went with no expectations and were completely blown away. I loved every bit of the whole place, we were slightly irritated with our son and his rush to get through the first part, however the dugouts and trenches were incredible and he got so much out of that part – hopefully something he never forgets! My kids are pesky like that too. I also often think my 9 year old is not engaging at all but turn months later he spews out all this information that shows he was paying attention. So why the stinky attitude at the time? Aggravating. That’s why it’s great when museums or other places strike the right balance between adult pitched information and interactive engagement for kids. I’m an over-planner. I create colour coded spreadsheets and sometimes colour coded maps for our trips. I have must do items and then other tiers of things we might do – bad weather items and “if we have time” items. Yet often it’s the things in the “if desperate” colour or the things that weren’t on the list at all that turn out to be the most memorable. It was incredible, I hope I inspire someone else to visit!! It’s fascinating and gets you hooked once you get started… this was the perfect place to live the history. 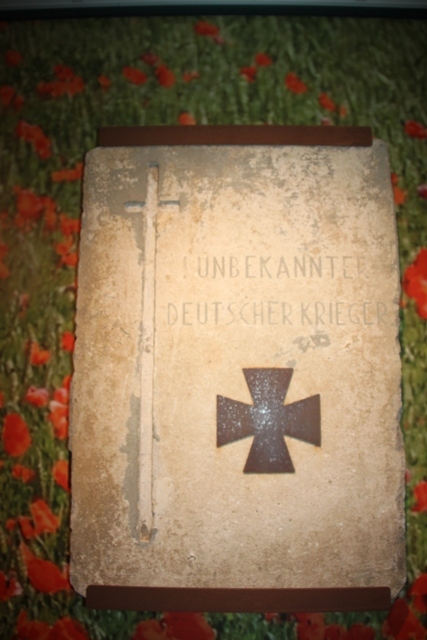 Terrific…I love that so many of the World War 1 sites have been preserved. That war sometimes gets lost in the shuffle. I’d love to visit some if these sites one day. There are so many incredible museums, sights and places to see in this little area, we found it all completely fascinating. This might have been my favourite museum – although that’s a hard one to call George!! 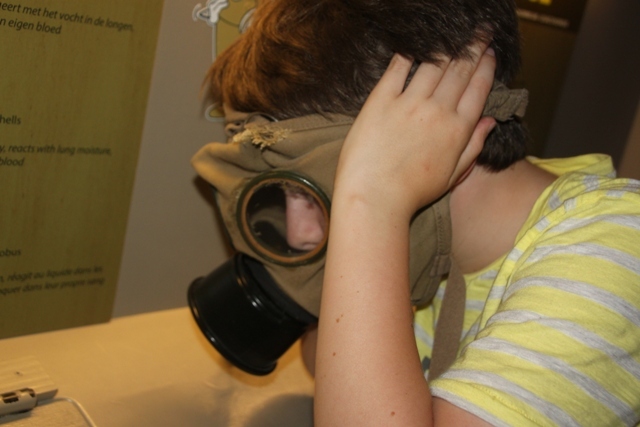 The looks like it turned out to be a really interesting museum for your son, with the underground part and trenches. Museums can be tough with kids, but when there’s something there that can draw them in, especially when unexpected, that’s the best. Glad it all worked out! My heart sank at the beginning, I thought it was going to be one of those rush through and out as quickly as possible places thanks to his lack of interest. 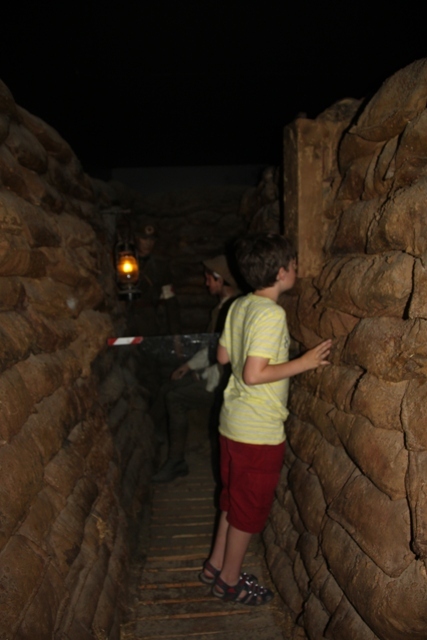 However the dugouts and trenches completely won him over – we found them incredible too, it ended up one of our highlights! Joy, this looks incredible! I love when we find the unexpected! That was exactly true here Pam and we had the most incredible experience at this wonderful museum. It’s great that they keep this place a testament to the fact that war is a horrid affair – especially if you have to dig into the earth like an animal to survive it. Thanks Melissa, yes definitely no glamour or niceness associated with the war here, it was presented as it is, horrific which made for a really memorable experience. It is a wonderful place Rosemary, one of the best of these kind of museums I’ve ever seen. The mix of normal exhibits, film and then these incredible reconstructions make it appeal to everyone for sure. Just need to work on our son to have a bit more patience sometime…. not an easy job!! Can’t believe the weekend has come round again already, time flies…. hope yours is fun filled too Rosemary. Fingers crossed for a win then Rosemary!! !